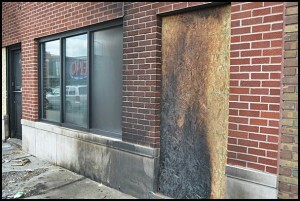 An arson-suspected fire at a would-be medical marijuana dispensary on Jos. Campau got the attention of other interested dispensary operators. Hold on there all of you would-be marijuana dispensary operators. After last week’s story in The Review about a proposed dispensary being targeted by an arsonist, about five other wanna-be operators asked to get a license to go into business, said City Clerk August Gitschlag. Gitschlag said he was about to forward to city council a proposed ordinance regulating dispensaries when Emergency Manager Cathy Square decided to hold off for at least the next few weeks. Square said she needs time to make sure everyone in her administration has reviewed the proposal. “We need to get organized before we can administer it,” she said. The city attempted to adopt a medical marijuana dispensary law two years ago but abruptly stopped when conflicting court rulings about medical marijuana were handed down. It was only recently that the city administration took the matter back up after getting repeated inquiries, Gitschlag said. Square said she expects to have a proposed law for the city council to consider by sometime in May. In the meantime, there are dozens of dispensaries operating in the metro area. One of the unresolved issues facing the council two years ago was whether to allow dispensaries to operate on Jos. Campau, the city’s main business center. It was not immediately clear how that issue has been addressed in the ordinance being worked on.